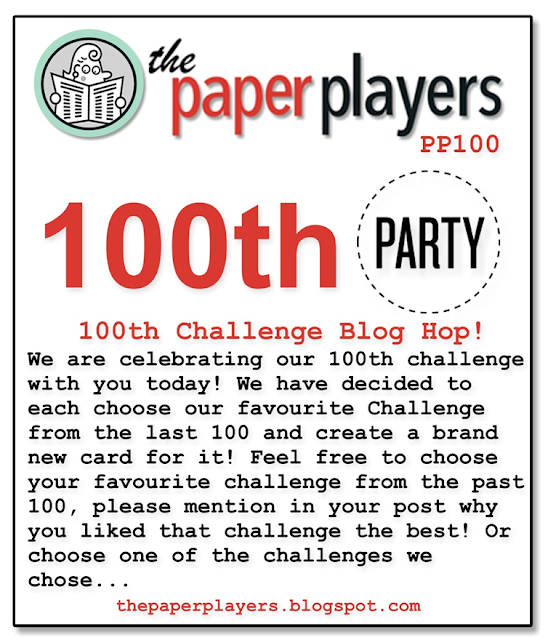 The Paper Players: Exciting News....Welcome to our 100th Challenge Celebration! Exciting News....Welcome to our 100th Challenge Celebration! Wow! 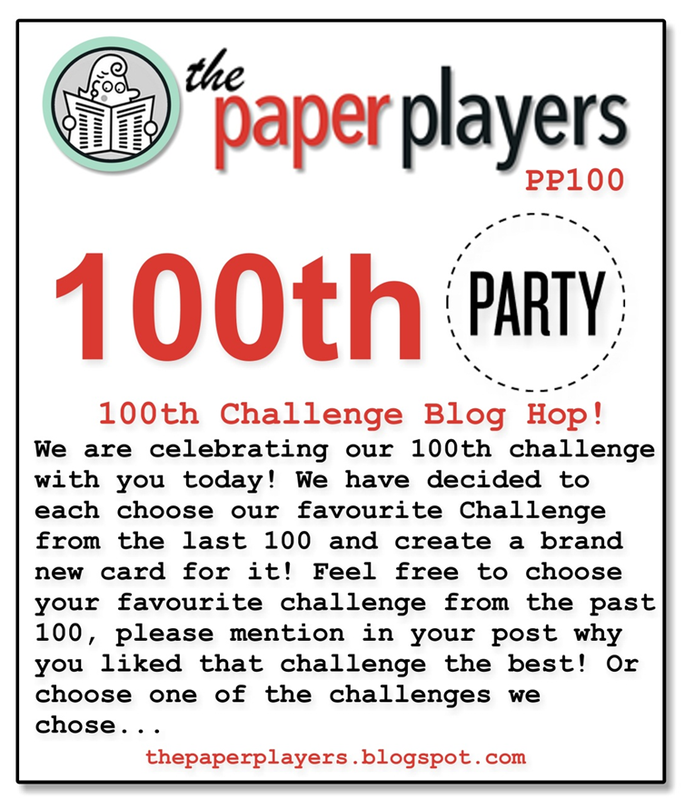 100 Challenges at the Paper Players and two years of fun! Thank you to my wonderful design team, our fantastic past guest designers and to all of our participants! Doesn't seem that long ago, when I started the Paper Players Challenge on my blog with LeAnne and Jaydee on my newly formed design team. choose any of our past challenges! Please no ANYTHING GOES CHALLENGES...thank you! We are offering all of our blog hop cards to our Headliner this week! We will mail them to you! So go ahead and HOP along to the design team blogs to see their favourite challenge from the past two years...and then create a card with one of our past challenges and link it up! ***Only combine THREE challenges TOTAL. We can't wait to see what you create! Won't you please join us this week? What an awesome way to celebrate! Congrats on your milestone and I'd like to say a big ole' THANK YOU for all of your hard work on bringing us such fun challenges. Wow! Congratulations on the 100th Challenge celebration. I love the blog and all the inspiration from your wonderful design team. Look forward to another 100! hugs. Congrats! on your 100th challenge! I enjoyed the blog hop and looking through your past challenges. Thanks! Congrats on reaching your 100th challenge. I enjoyed looking over past challenges to find the one that would call out to me. Thanks for all the great inspiration; I look forward to hundreds more. How fun seeing all the different challenges! Great job reaching the 100th challenge. Keep up the great work! Congratulations on your 100th challenge!! Thanks for the inspiration! Congrats on your 100th challenge! I just found this challenge, this is my third time playing, and I had a ball looking through the challenge archives. I look forward to seeing what you guys come up with for the next 100 challenges! Congrats on the 100th Challenge!!! TO bad I had my head in the sand and did not see it until today!! !I would have played along! LOL Love all you gals, Thanks for 100 Challenges worth of Inspiration!! !